On the left is the back of the paint-it-black entry door, which stores all my aprons. The apron on the right is special and you can read about it and cry. I hung a tiny windchime on the peg with that apron and hear it whenever the door moves. It makes me smile. To the right of the door is a temporary landing pad for nearly anything I don’t want to lose in the studio fray. The drawers below the landing pad contain catalogs, color charts, graphite and carbon paper, sanders and scrapers, Very Odd Tools, some glazing helpers (which I’ve decided right now need moving) and *gasp* an empty drawer! I could do better with this easily reached rolling cart. Those loaded shelves are for my underglazes, which have clearly hit critical mass. I am in the middle of switching back to smaller containers (2-3oz) and many of those pints are nearly empty. I need to frugally use their last dribs and drabs before buying the smaller size. It has been a long haul researching colors and brands. I have clear favorites, even among the whites and the blacks. All the unfavorites will get used and not replaced. A year or so from now I expect to be able to reach for my dearest underglazes without knocking three other second place ones off the shelf. 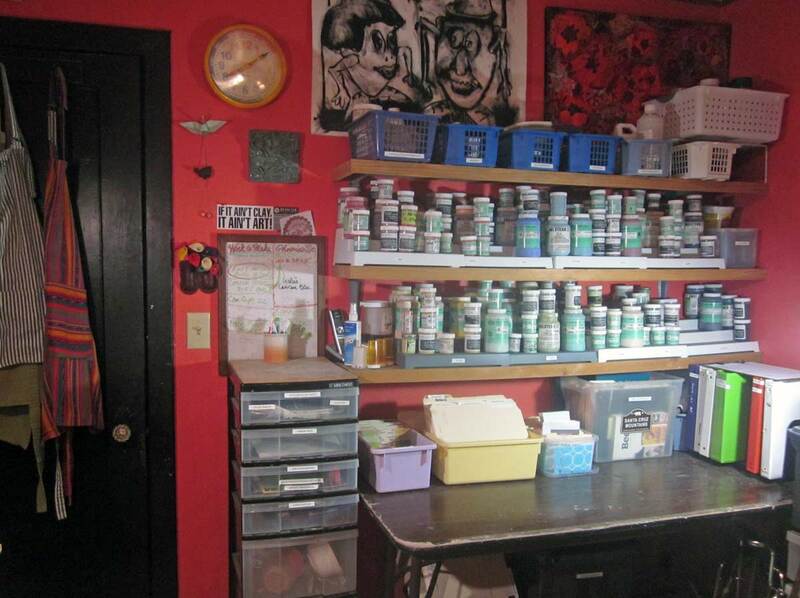 The top shelf carries bins of specialty items: waxes, sealers, menders, underglaze chalks and pencils, adhesives and powdered colorants. I can just reach them, so they’re perfectly stored. On the wall behind, you see a fun artwork by my buddy Diane Patracuola titled “Mr and Mrs.” And yes, they are Potato Heads, which she has a thing for. To the right is a collage-painting of poppies that I made, which is warped, but just right tucked up there, creating mystery. 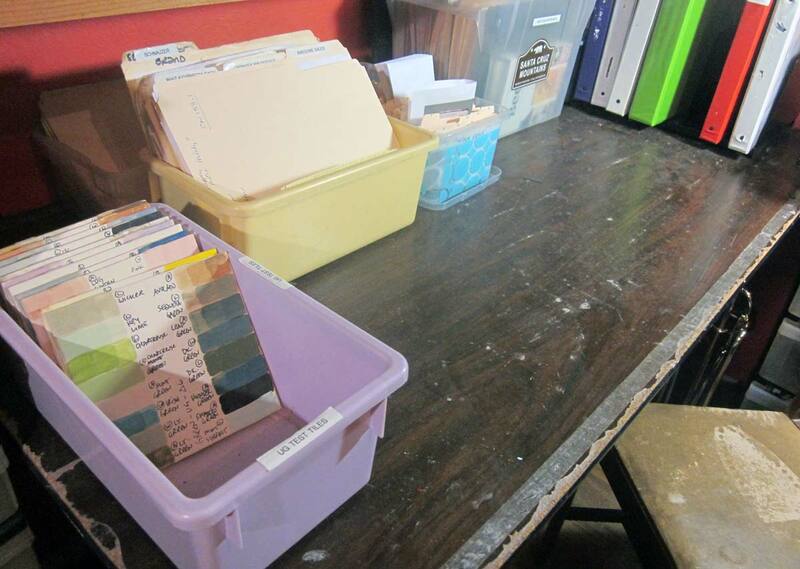 Down on the table is the tub of test tiles for all of my underglazes, along with reference file tubs and binders of my studio production logs. Those test tiles were a project. I had so many out-dated, broken, incomplete tiles it hampered my thinking. Now I have ten uniform tiles of up to 16 samples each, grouped by hue and value, fired to Cone 6. What a gift I gave myself in making them: the gift of thorough and current knowledge. I have begun to use my underglazes with awareness of color, coverage, feel in the brush, mixability. My preferences have lead to creating hues that are not available commercially. 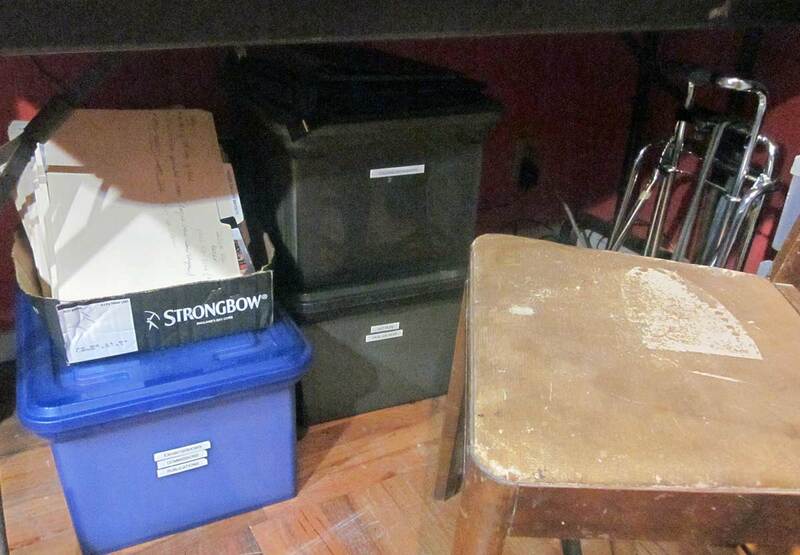 At the back on the right are my Studio Logs. It is a paper system in which I make complete notes about each piece as I create it: sketches, clay, underpainting, liner glaze, outside underglaze and “rust” colors along with application methods, firings, any re-firings, critical assessment, final dimensions, inventory number. I later enter the info from them online into the fabulous Artwork Archive, where I keep my show, gallery and sales records. I am in transition here as well: how can I keep all my records about each piece in one place? Not much can be kept under a chair-height table. And it needs to be grovelled-for in order to access it, so here I have tubs and boxes of deeper storage: Old events, galleries, shows. Teaching handouts and lesson plans, general art reference, articles and workshop handouts. Plus a hand cart I barely use now, so it can live happily in the near-depths. The dry erase board contains current projects and deadlines, as well as my notes of what I have run low on and where to get it. There is fun stuff all around it. My Roscoe Ceramic Gallery bumpersticker, an abstract tile mosaiced with odd bits of bisque, a birdie bell, crystal and origami crane. 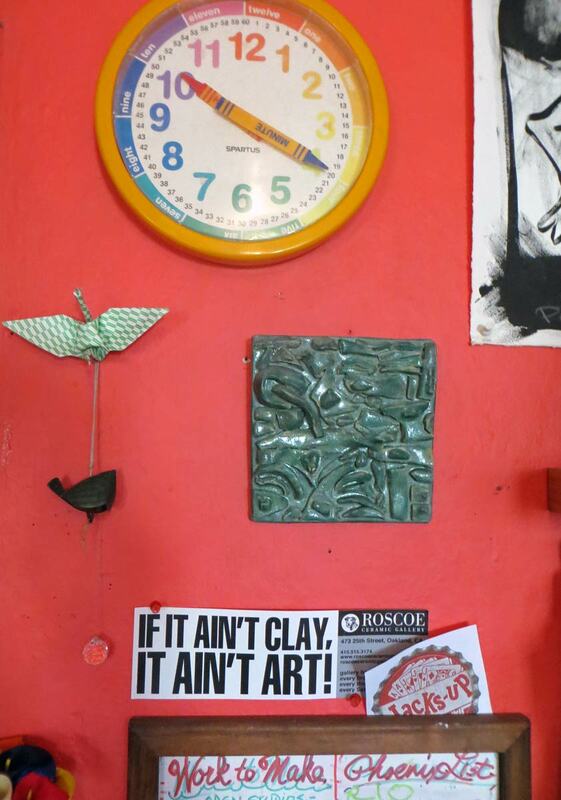 Best of all is that vintage analog time-teaching clock which hung in my boys’ bedroom from their toddler days on to community college. When I’m gone, I feel they will each want it more than most of my remaining work.